After beating the main game of Fallout: New Vegas on a single healthbar, Let's Player Many A True Nerd is back once more—and he's making the challenge even more bonkers. Those of you that checked out our initial story know that Many A True Nerd had a playthrough of New Vegas where there was no healing, no sleeping, no buff items, no radiation recovery, and no companions. It is probably the most bananas thing anyone has ever done in New Vegas, and it pushed the game in ways it wasn't meant to be played. That's what made it so good. But, the story of Please Don't Shoot doesn't end there. 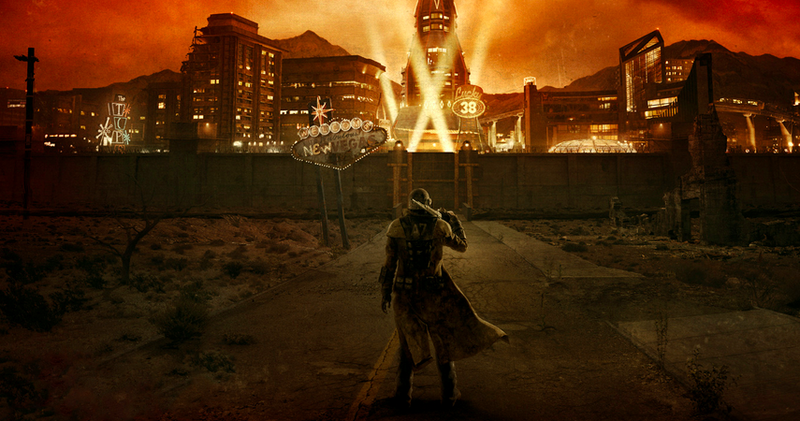 Many A True Nerd also plans on playing all the DLC for New Vegas, to see how long he can survive on a single healthbar that can never be replenished. That is, he's using the same health bar that he was using for the vanilla New Vegas run. First up is Honest Hearts, the DLC where players learn about the legend of Joshua Graham. Fallout veterans know him as the character that is said to have survived being thrown into the Grand Canyon while being set on fire by the Legion. At the start of this run, Many A True Nerd has 260 out of 445 health points—his health is almost half gone. In preparation for the continued DLC run—which is expected to be way more difficult than the original game—he stops by Novac to pick up a special gun. Called Paciencia, it's a variant of the hunting rifle. Amazingly, it packs a ton of bonus critical damage, which can make it hit as hard as the anti-material rifle. Equipping it with special hollow point ammo can increase damage up to 75% against enemies without armor—which makes it a great pick for Honest Hearts, as this DLC features plenty of natural wild enemies, like bears. Taking the gun, the ammo, the special perks and skills he's accrued along the way, Many A True Nerd can do up to 500 damage per shot against most enemies in Honest Hearts. He could, hypothetically, easily one-shot Cazadores. Once in Zion, the trade caravan that Many A True Nerd is travelling with gets ambushed. He makes short work of them, which initially makes it seem like this run will be a cakewalk—but minutes later, he takes a bit of damage unexpectedly. It's a good reminder that, regardless of how much he prepares, and regardless of how good his character or gear are, he still only has a single lifebar—and even minor hits can and do add up. The continued run is, unsurprisingly, very tense—which makes it a joy to watch, even if you've played through the DLC before. Any bets on how long he'll be able to make it in the DLC? I'm hoping he can beat all of them—it would make for an amazing run. We'll keep you posted on its progress.